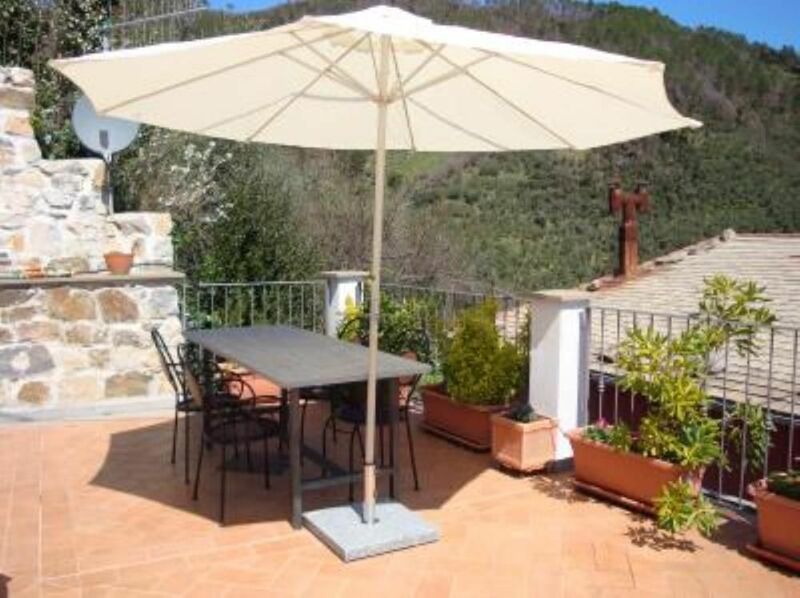 Fantastic, modern apartment in quiet, stunning location but very close to town, great veiws. We stayed here for 10 days in August 2018 with our teenage daughter. Apartment is bright, modern (inside) and well equipped. It was very clean with comfortable beds and a good shower. There are maps and leaflets available to help you decide where to go and what to do. There are superb views from the relaxing terrace. It is also very quiet with no church bells ringing at night. We loved walking to/from our car each day through the pathways in the village (your car is left lower down the hill). Elena's parents are very lovely people. Friendly, helpful and hospitable but respectful of privacy. They met us by the 'main' road on arrival and took our luggage to the apartment in their piaggio (tiny vehicle) which can drive up the pathways. We then sat down to an amazing lunch made and served by Elena's mum who speaks excellent English and gave us lots of helpful information about beaches, restaurants, places to visit, etc. We had a 'free parking' permit for a car park in Levanto (a 4km drive down the hill) which we used daily. Once in Levanto we used the trains to visit the Cinque Terre, La Spezia and for a day trip to Genoa. We swam and snorkelled off the rocks in various little bays along the coast, went for walks and visited some of the villages and towns on the coast. We ate fantastic food and ice cream, drank coffee and enjoyed a very relaxing holiday. People were very kind and friendly (we do not speak Italian but most people spoke some English). This apartment would make a great short break at any time of the year and can be accessed by public transport. The train journey along the coast from Genoa is interesting and you can get a bus up the valley from Levanto to Lavaggiorosso, or you could hire scooters for added excitement. We highly recommend a stay here, it was very enjoyable and relaxing. When our gracious hosts asked me the place I enjoyed the most on our trip, I responded without hesitation that Lavaggiorosso was it. For me, the location was ideal: small quiet village with one of the region's best restaurants, not far from Cinque Terre but far enough to not have tourists in our hair, and an exquisite view from our apartment's rooftop terrace (where we enjoyed dinner and wine on more than one occasion). When you add to this the flawless hospitality of our hosts and the spotless and tastefully appointed apartment itself, you have something truly spectacular. A word of warning: if you hope to be somewhere with happening night life, tonnes of cafes, tourists, and so on, this is not the place for you. If, like us, you are interested in good food, relaxation, hiking, scenery etc. you can't go past this little slice of paradise in Lavaggiorosso. "Lavaggiorosso is one of the best places we have ever been so far. The flat was absolutely great! Despite there was an airconditioning, we have not used it, since the house itself had so good climate that we did not have to do so. The silence and beautifil surrounding gives the place a unique character that I have never experienced on my previous holidays in Italy. The whole appartment is very effectively and very nicely equiped. Modern pieces connected with old-style artefacts make a nice place where you just have to stay. And the incredible terrace is just great. We will definitelly come back to this appartment in future. I highly Recommend it." "Fantastic appartment in small and quiet village. Very friendly and helpfull owners. We''ve had a pleasent stay." Superbe semaine dans un petit village perché, logement parfait et conforme au descriptif. Semaine dépaysante. Propriétaire très accueillant et très serviable avec pleins de bons conseils . MERCI ! The Village is located about 8 km from Carrodano exit on the Genoa - Livorno higway and almost 4 km from the centre of Levanto, which can be also reached by train on the Tourin - Milan - genoa - Rome railway line. There is a bus service from and to Levanto. The house is got only by walk at about 100 mt from sqare reaching by car and about 250 mt from the parking. In Lavaggiorosso you can find The Zita Trattoria, where in a simple and familiar setting you can taste the tipical dishes of ligurian cuisine with a spectacular view in front of you. At 6 Km you can find Agriturismo Ca Melana where you can taste the dishes of the Mountain in a beautiful valley. In Levanto you can taste dishes of fishes in the Ristorante Da Tapulin with a good proportion price - quality. Tariffe scontate in relazione alla durata, Deposito cauzionale, Caparra richiesta alla prenotazione, Consegna delle chiavi da parte del Proprietario, Proprietario non presente in loco. Villaggio non transitabile in auto, parcheggio più vicino a 250 metri dall'abitazione. Facciamo servizio trasporto bagagli all'arrivo e alla partenza.